If you follow me on Instagram, you'll have seen that I spent pretty much all of bank holiday Monday transforming our garden. Having some outdoor space was one of the things we were most excited about when we bought this house. We envisaged having friends round for BBQs, eating our dinner al fresco and enjoying a beer out there on sunny summer evenings. What happened in reality is that our little garden quickly became overgrown with ivy and weeds, and it was relegated to a dumping ground for DIY paraphernalia and leftover wedding signs. But with the promise of a sunny bank holiday weekend, and plans to spend as much of the summer months at home as possible, I knew I wanted to sort it out. We only have a little cottage garden, so it's not a huge amount of space and we don't have to worry about grass, but it still posed quite a big job, as you can see from the "before" picture below. The biggest challenge we had was that we didn't have a huge budget to transform our garden. In an ideal world we would have just paid someone else to re-flag it and maybe create a few planting areas, but with an expensive holiday and a kitchen makeover on the horizon, we knew we just had to work with what we had and limit our spending. But we managed it, and I'm pretty bloody happy with the finished result. Sitting out there with my book and a glass of wine is now an absolute joy, and every time I head out there to water the plants I feel like a very lucky lady. The biggest part of our garden makeover was the most boring and time consuming part - clearing it of weeds, overgrown ivy and dead leaves! It took us a good few hours and a lot of graft to get rid of a couple of years worth of overgrowth, but it already looked like a different garden by the time we'd finished. Clear some time in the diary, rope a couple of friends in and get to work - you're garden will be looking tonnes better before you've even spent a penny. Once we'd given everywhere a good tidy up, we turned to paint! We had to repaint our back door anyway, so picked up an extra tin and got to work in making the fences and gate look pretty too. The paint cost me a mere £15 (and there were some cheaper ones available), but the splash of colour has made the garden look SO much better. I knew I wanted to get some pretty lights for our garden, and after trawling the internet it looked like they were going to set me back about £20 a pop. I called into B&M on a whim, and whaddya know, they had the exact lights I wanted for £7.99 a box! I also found some plant bargains at B&M and Morrisons too, so it really does pay to shop around rather than just buying everything in one place. My last tip for transforming your garden on a budget is to work with what you've got. As mentioned above, we could have spent an absolute fortune on reflagging our garden and having some new fences put up, but actually, once we'd dug up all the weeds and given everything a good brush, we realised that it would be fine as it is with the addition of a few pots and a lick of a paint. If you're on a budget, think about how you can improve on what's already there, rather than having to start from scratch. There you go, my top tips for transforming your garden on a budget. 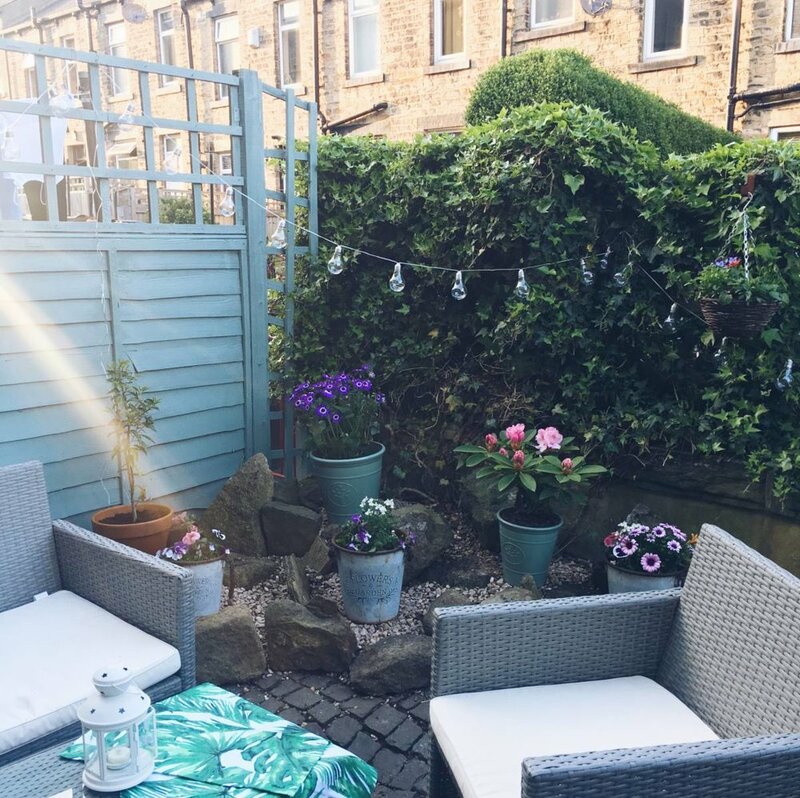 I have to say, I never thought I'd write a gardening post on this blog, but I suppose that's what hurtling towards your thirties looks like... Hope you enjoyed it!